– I love that the Buffalo News is finally giving Pratt and Kalinin some love. They’ve been a rock steady defensive pairing over the past couple of weeks. Its pretty good that they’re at a plus-1 in the last five games, including not drawing a negative in any of them. Tri’s name is starting to pop up in some trade rumors, now that the deadline is only a week away. I do have to ask management why you would want to break up one of your more solid pairings? And “for thrills and giggles” is not an acceptable answer. – Last night’s newscast showed Soupy vehemently denying that he had a deal in place with the Sabres. I’m really starting to feel bad for Soupy. He was close to tears denying this latest rumor. Some of you might be thinking that he made his own bed by taking negotiations public, but this is just getting uncomfortable for everyone. Its starting to affect his on-ice performance, and it can’t be good for the guy mentally to constantly be thinking that every time he comes to the rink in the next week might be his last time as a Sabre. – Last night I listened to Goose’s interview with Schopp and the Bulldog on the WGR website. The station was nice enough to archive the entire interview, which was a good 40 minutes in length (the perfect thing to listen to while reading Project Runway recaps, IMO). The length of the interview allowed for some really good topics to be discussed, including how Goose came to the station that day. Schopp and Bulldog made fun of him for taking the longest route known to mankind, especially in the afternoon. (He took the 198 to the 33 to the 90 to the 290, in case you were wondering. And I do agree that he took a really, really, long circuitous route.) They offered to give him directions to use things like side streets, so that going from Buffalo to Amherst wouldn’t be such an ordeal. Goose also talked about what makes him fight. He only fights to defend teammates or change the momentum in the game. He’s not going to fight just for thrills and giggles, and a good part of being a professional player is knowing when to walk away from a fight, knowing that it might shift momentum to the other team. Speaking of the Goose and the Pommerdoodle, we already know that they’re roomies on the road (along with Hecht / Crunchy and Mair / Patches). However, there’s been a disruption in Roomie-land, as Pommerdoodle has now won control of the remote in the hotel room. A bet was made on the Seahawks / Packers football game. Winner got remote. Goose was for the Seahawks, and with a 14-point lead, he was pretty confident, even engaging in a little trash talking. However, he soon lost the bet, as the Pack came back to win. Goose has let it be known that he is not happy with this outcome, and Pommers has let him know he doesn’t care. Ha. Goose also talked about what its like to play with the flu / strep (flep? frep? ), which he had a couple of weeks ago. The illness talk lead into a discussion about players losing weight during games. I didn’t know that players could lose as much as 6-8 pounds during a game, and that they were weighed before and after games. (I have a love / hate relationship with my scale, so I can’t imagine stepping on it twice a day.) It also lead to a pretty hilarious exchange about what its like for Miller, who doesn’t have 6-8 pounds to lose on a good day. – I also caught a little bit of Time Warner’s Power Play show this weekend. Pat Kaleta was the guest star. He didn’t have a lot of good detail to share about the team, considering he’s still a newbie. A lot of what he shared was about the guys in Rochester. However, this show is not doing much to rid me of the perception that Danny Paille needs adult supervision. Kaleta named him as the person most likely to forget to put on their skates before going on the ice. This is in addition to Staffy naming him most likely to eat something that fell on the floor and most likely to lock himself out of the house / hotel. – And there’s a game tonight. Whoo-hoo! And Project Runway Reunion show! And the Mythbusters McGuyver episode. Whoo-hoo! My DVR’s going to be busy tonight. And by god, we got them! I haven’t had so much fun watching a hockey game in a long time. Where to start? – Stafford and Roy’s dueling hat tricks. All of Stafford’s goals were beautiful. He was such a beast last night, and his first star announcement was well deserved. I was really amused that during his post-game interview he had a Sabres Santa hat hanging in his locker. While I know that was thrown on the ice during the hat trick celebration and he probably didn’t know where it came from, I really was hoping he would have put it on during the interview. He could have been Staffy Claus! – Eric Boulton is such a thug. His sucker punch of Pommerdoodle was uncalled for. I do like that Pratt and Hecht stepped in to defend Pommers immediately. How can you sucker punch Pommers? Its the equivalent of hitting a puppy with a newspaper just for trying to cuddle up with you. 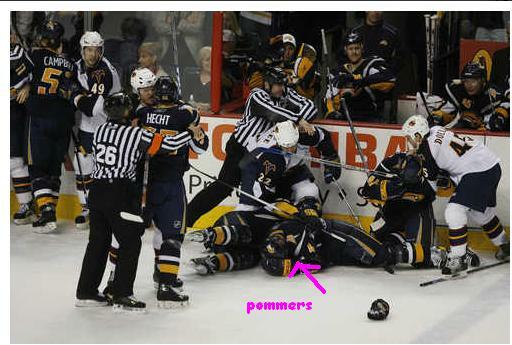 I did find it funny that Pommers just crumpled to the ice and put his hands over his head, very turtle-like. – I mentioned Nolan Pratt in the last comment. After last night’s display of physicality, remind me again why he’s been up in the press box? In addition to being a noted Miller defender, he stood up twice last night, getting into a fight with Thorburn (who made a controversial move in coming off the bench to take on Pratt, when Pratt really wanted Exelby. And seriously, who the heck names a boy Garnet? I feel like with that name he should be one of Miss Scarlett’s suitors or something.) When Spacek comes back this week, if Pratt sits over Patches, I may have to have words with someone. – I had to laugh at Roy during his post-game interview. The padding he had over his shoulder made him look like he was auditioning for a role as Pancho Villa (“goals, we don’t need no stinking goals). – The Sabres penalty kill continues to be fantastic. They killed off 8 penalties, including an almost 2 minute long 5-on-3 situation. And the power play finally kicked into gear last night, with four power play goals on 16 power play opportunities. – I was really amused at Adam Mair’s repeated requests for gum during the game. And then the trainer pulls out this giant tupperware tub of Dubble Bubble and other pure-sugar-rot-your-teeth type gum. I’m still amazed that these guys can chew gum during a game, and no one’s ended up choking yet. – Its unrelated to this game, but it will also be really interesting to see how the Pens handle Sid’s absence for the next month. Will they continue to be in the playoff hunt, or will they fall faster than a body with cement shoes? You are currently browsing the archives for the Nolan Pratt category.